Although standard latches can be incorporated, magnetic catches on a 'pull to open' basis combined with anti-finger trap doors are all part of the new built in safety features of the Luca range. Built on solid and stable legs the Luca range eliminates the need for a headrail, making the installation process easier and also giving a wider scope for the design of the cubicles - allowing the range to be themed to create a welcoming and fun environment. 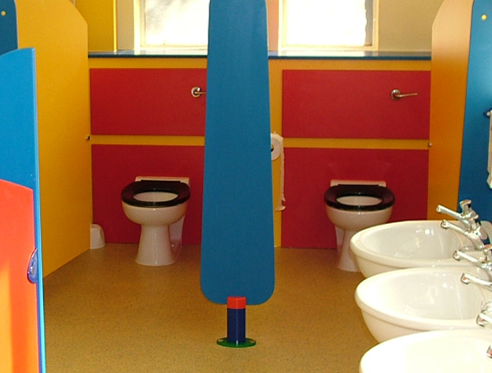 This reduced height allows 360° vision to washroom supervisors, involves less cleaning and maintenance costs so therefore allows providers to create an environment they want at a price they can afford. The hinges on the Luca range are strong and safe. Incorporating an anti finger trap design to provide a safe environment for children.